Breakfast is the most important meal for the day as it provides you about a third of your nutrition needs.Therefore selecting the right breakfast is not just important but critical. Oats are not just the right way to start your day,but also the best bet for weight management.They help keep your sugar and cholesterol level low thus lowering your risk of heart diseases. The soluble fibre in oats lowers cholesterol.It also helps maintain blood pressure.It can help keep your arteries clean and healthy.The ability of Oat soluble fibers to absorb water and swell,creates a feeling of fullness and helps in maintaining weight.It also assists people with diabetes in managing their blood sugar levels. There is no better way to start your day than with a bowl of nutritious oats.After all,breakfast is the most important meal of the day - nourishing you with all the vital nutrients you need to help you and your family make it through the day. Oats not only provides you with a warm and delicious start to day, but also gives energy to help keep going all the day. Here is a Simple healthy breakfast with Oats and loads of colourful vegetables. 1.Heat 1 tsp oil in a kadai and roast the oats until it turns light brown.Keep aside. 2.Heat oil in a kadai/pan, add mustard seeds and allow to splutter. 3.Add channa dal and urad dal and fry till brown, add curry leaves and hing. 4.Add finely chopped Onion,green chillies,carrot,peas,turmeric powder, and salt stir for 3 minutes. 5.Now add roasted oats and stir again for 2-3 minutes along with vegetables. 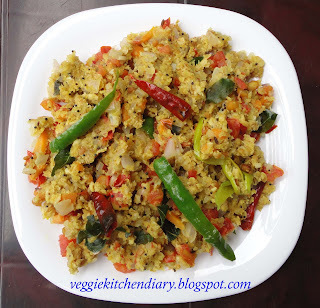 6.Finally, Sprinkle 1/2cup of water on the oats mixture and stirr.Make sure to not add excess water to the Oats Upma as the whole mixture can become too soggy .When oats turns soft,switch off the flame add lemon juice and top with coriander/dhania leaves.